Luís Antunes Pena is the composer "In Focus" at the mic.pt in January. He looks for "new forms and sounds for his music of granitic strength, profoundly linked to investigation of the materials' sound potential." He studied composition at the Arcos Professional School in Estoril with Evgueni Zoudilkine and at the Lisbon Superior School of Music with António Pinho Vargas. Then, he continued his education at the Folkwang-Hochschule Essen (Germany) where he studied instrumental composition with Nicolaus A. Huber and electronic music with Dirk Reith. His interests for new music and its dissemination led him to create, together with Diana Ferreira and João Miguel Pais, the International Festival of Contemporary Music "Jornadas Nova Música". Living in Germany since 1999, his production encompasses various genres of chamber and soloist music with or without electronics, as well as acousmatic and stage music. Through another Questionnaire / Interview, discover the composer Luís Antunes Pena who in January celebrates his 40th anniversary. In 2012 the Portuguese Music Research & Information Centre had more than 500.000 visits and has 6600 registered users. Since 2010, the number of average monthly visits has been raising about 2% per month. Presently the mic.pt has around 50.000 monthly visits. This fact shows clearly that the Portuguese Music Research & Information Centre becomes increasingly a point of confluence, which is an important incentive for the development of the mic.pt activities and a significant signal of the vitality of Portuguese music and its increasing presence around the world. The New Music Review Lounge published the review by Virgílio Melo, "Four Premieres, Three Composers, Two Generations", about four premiere performances of works by Igor C. Silva, Álvaro Salazar and Filipe Pires, which took place at the Casa da Música in Porto on November 17 and 27, 2012. Arte Eletroacústica is a radio programme presented, directed and produced by Miso Music Portugal and the Portuguese Music Research & Information Centre for the Antena 2 National Radio, in conjunction with the Ars Acustica group, of the European Broadcasting Union. Every month, fortnightly on Saturdays at 1 a.m., Arte Eletroacústica presents to its listeners an art which constitutes the pulse of the future, making use of new technologies, interactivity and multimedia, giving them uncommon auditory sensations and letting them rediscover the radio as a platform for new aesthetic experiences. Diana Salazar - "Papyrus"; Alejandro Montes de Oca - "Cracked Voices"; Manuella Blackburn - "Vista Points"; Sara Ross - "Paper Over Voice by Means of Guitar"; Nuno Figueiredo - "The Electronic Sounds of Birds"
Miso Ensemble - "4 Estações - Inverno & Primavera", "Constelações", "Água ou Maré-Nome de Pedra"
The Polish Section of the International Society for Contemporary Music announced the results for the World Music Days 2014 Festival, which will take place on October 3-12, 2014 in Wroclaw (Poland). The jury members Elzbieta Sikora, Pierre Jodlowski, Luca Francesconi, Peter Swinnen and Jacek Rogala, have evaluated more than 500 scores (196 individual and 313 section entries). During the World Music Days 2014 Festival, Portugal will be represented by two works: the children opera "A Menina Gotinha de Água" by Miguel Azguime (cat. 5 – one act opera for children) and "All-in-one" by Carlos Caires (cat. 2c – chamber orchestra). The new Miso Records CD, "Suzanna Lidegran - Portuguese Music for Violin", within the "Sond'Ar-te Electric Ensemble Soloists" series, was released on December 7 during the Miso Music Portugal Concert Season at the Cascais Art Centre. This new CD brings us new Portuguese music for solo violin by the composers Cândido Lima, João Madureira, Miguel Azguime, Ângela Lopes and Emmanuel Nunes under the masterful interpretation of the violinist Suzanna Lidegran. The ECPNM – European Conference of Promoters of New Music hosts the sixth European competition for the composition and interpretation of live-electronic music projects. The organising partners of this competition are members of the ECPNM such as: EULEC in Lüneburg / Hamburg, Germany; Miso Music Portugal; Gaudeamus Muziekweek, the Netherlands. 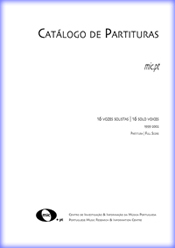 The online edition and distribution of scores is one of the principal activities of the Portuguese Music Research & Information Centre. 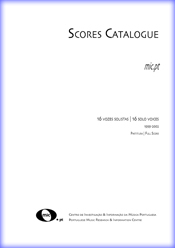 At present, there are 669 scores by 44 composers available for free download at mic.pt. The Portuguese composer Andreia Pinto Correia was one of the awarded composers this year, by the Fromm Music Foundation of the Harvard University in Massachusetts. According to the Fromm Music Foundation, created by Paul Fromm, the prize is a four-week artistic residence at La Mortella (on the Italian island of Ischia, near Napoli), which was Sir William Walton's last place of residence.